Of all the places we’ve been in Siargao, this is definitely the best part of my trip. There were so many activites to do and so many places to visit here in these wonderful group of islands. 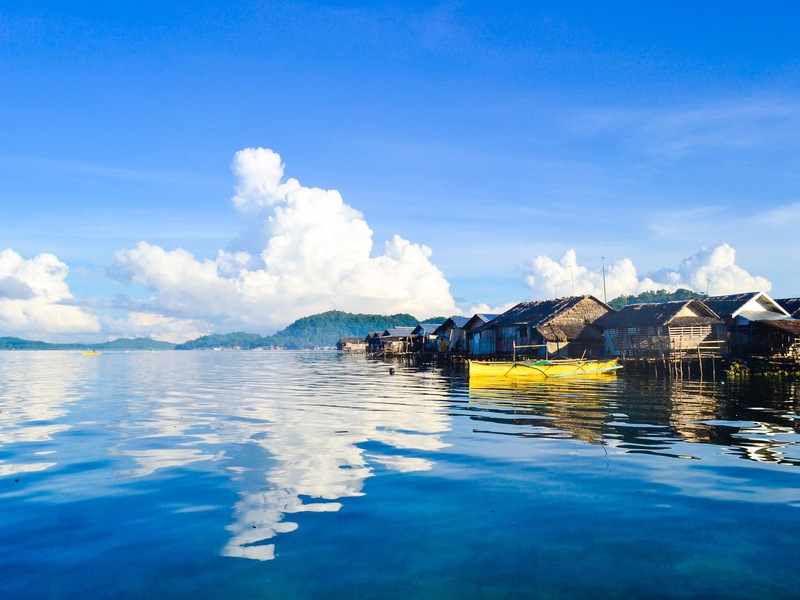 If Philippines could be comprised in one place, it would be Bucas Grande Islands or otherwise known as Socorro which is a lone island municipality in Surigao del Norte. To be honest, our tour to this gorgeous island wasn’t included in the itinerary because this would consume one whole day. I was kind of hesitant then to go here because I prioritized the three adjacent islands in General Luna namely Naked, Dako and Guyam Islands in our planned journey. We were scouting for a place where we can enjoy half day because the other half would be spent to the three islands. We thought of Caob Lagoon due to its excellent reviews and privacy of the place. However, our tricycle driver insisted that we should go to Bucas Grande because he said the view was so worth it and people said it’s better than in Palawan. He also added that they can fit it into our hectic schedule. Bucas Grande is not cheap when you travel in small groups because an average tour rate to this place is 8000 pesos and we were only three. Imagine the price of paying 2600 per person which would eat up our target budget of spending only 6000 on this trip. With luck and kind negotiations, we were able to reduce our tour to only 4000 pesos. We already arranged for our food for island hopping with the driver the day before our tour. We gave a budget of 800 pesos and they were the ones to buy from the market, cook and serve our breakfast and lunch for the next day. We met the driver at the port and we were just amazed of how clear the waters are despite that there were inhabitants situated near the area. The tour took about two hours and here our driver, Francis, was entertaining us with the right humor and guiding us throughout the day. We passed by the mangroves which were very abundant in the area. Coconut trees are widespread in the island. Even while we were still in the plane, we had witnessed how numerous the trees are here in Siargao. Imagine the whole mountain plainly filled with coconut trees. The view reminded me of The Hundred Islands in Pangasinan but these were different in terms of its beauty and greenness of each islet. The stony vibe of the islands made me think of Survivor. We entered into the islands of Bucas Grande. Before heading to our first stop, Tiktikan Lake, we passed by Club Tara Resort. We were planning to check in here. Thankfully, we didn’t because we would end up in isolation and it would be difficult for us to follow our itinerary. But if you want some privacy and luxury, then this is one of the places you can stay in aside from the famous Dedon Island. We decided to have our breakfast at Tiktikan Lake. The driver brought us here instead of the common staff house that tourists eat in. He said he wanted ours to be private and it was just a walking distance to the Lagoon Lake. While the boatmen were preparing our breakfast, we proceeded to Lagoon Lake. You will take a little hike to get there. When I say little, you don’t need to make an effort. It’s more of like a 5 minute walk to the top. The lake evoked me so much of Twin Lakes in Sibulan, Negros Oriental. However, Lake Balinsasayao in Sibulan is bigger compared to this. The Lagoon Lake adds another dimension to the uniqueness of these islands in Bucas Grande. If you want to see the panoramic view of the lake, you can stay on their viewing staff house. It’s like a mini open function hall where you can eat in or just chill out. You also have the option to stay here for the night. They offer cheap rates as low as 150 per head and you can already enjoy nature at its best. We returned to Tiktikan Lake as our breakfast was already ready and we were astonished that they were able to fit our mere and cheap budget into a breakfast feast. The small cottage we stayed in is built on top of the lake. They had a “tiangge” wherein you can buy some grocery items in case you forgot something. They also breed lobsters which are very pricey. They can sell up to 2000 per kilo and they are export quality. So just in case you have an extra budget, you have the option to splurge for it for breakfast. What’s amazing is that you can swim and do some cliff jumping. My life stopped, literally, having flashbacks while jumping from a 15 feet or a 2-storey high building and plunging myself in the pretentious and deep blue waters of the lake. Next on the itinerary was the Crystal Cave. It’s a 5 minute trip from the Tiktikan Lake. We were given flashlights upon docking and did an easy hike towards the cave. At first I thought it was just like the usual caves that I got to see with my previous trips and never had I imagined that it was the most unique and creepy in some way because it felt like a real cave. The rawness and the brilliance of the stone formations reflected like crystals. The fact that it wasn’t developed and left untouched gave it a sense of realness and a natural experience. There were two paths in exploring the cave. The first path which we took is the Crystal Cave where it only involved walking and a lot of selfies and groupies. We wanted to try the other option which is the Bolitas Cave, but we weren’t prepared for it because you need to do a lot of crawling like in the usual cave exploration done in the movies. Spelunking to this narrow path would be exciting but we just couldn’t do that in our bikinis. Before heading back to the entrance, the boatman made us turn off our flashlights so that we can really experience the cave, of being in the dark and hearing its nothingness and it was just tranquility for me. It was almost low tide, about ten o’clock in the morning, and it was time to go to the Sohoton National Park. We docked in their main cottage. We registered and paid for the entrance, boating and environmental fees. We transferred into a small boat. It could only carry one passenger and the boatman so we did kayaking or paddling towards the Jellyfish Sanctuary. Another name for this is Tojoman but it’s popularly known as Jellyfish Lagoon. The place was by far the most magical thing I have ever seen. The water was so blue that you need no filter to make it beautiful. I wanted to stay here forever and have this in my backyard. Haha! Another bonus to complete this experience was being able to witness and interact with the cute jellyfish. There are many varieties of jellyfish you can find here and they become very abundant during the summer season. If you have an ample time, you can swim in the awe-inspiring waters and take underwater selfies with these grand marine creatures. 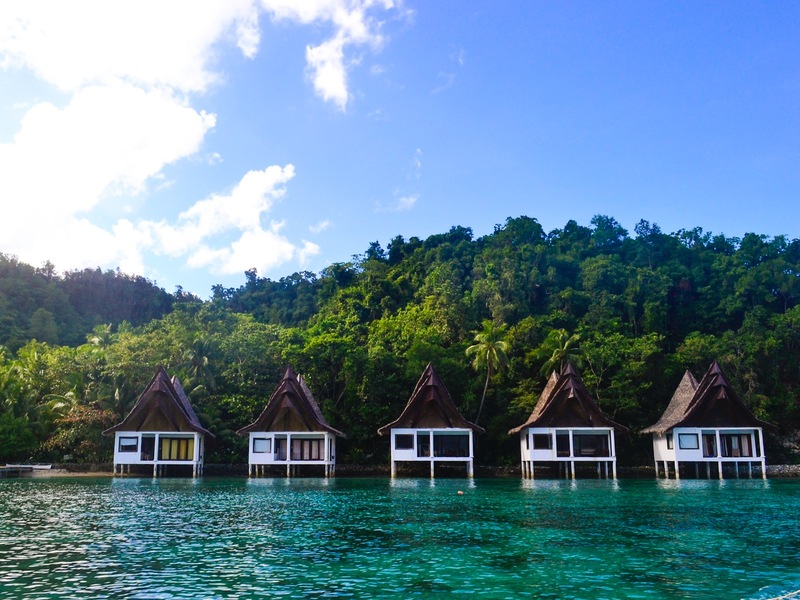 It was now time to go the most awaited trip ever which is the Sohoton Cove. We were led back to the reception area and transferred to a bigger boat. The reason why it’s important to wait for the water level to come down is you can never get inside the cove unless it’s low tide because there is only one entrance. The limestone rock formations reflect the green natural waters and seclude the place amidst the welcoming vibe of the scenery. The tour guide even added that during the storm, fishermen tend to hide here because of its isolation and the calmness of the waves. 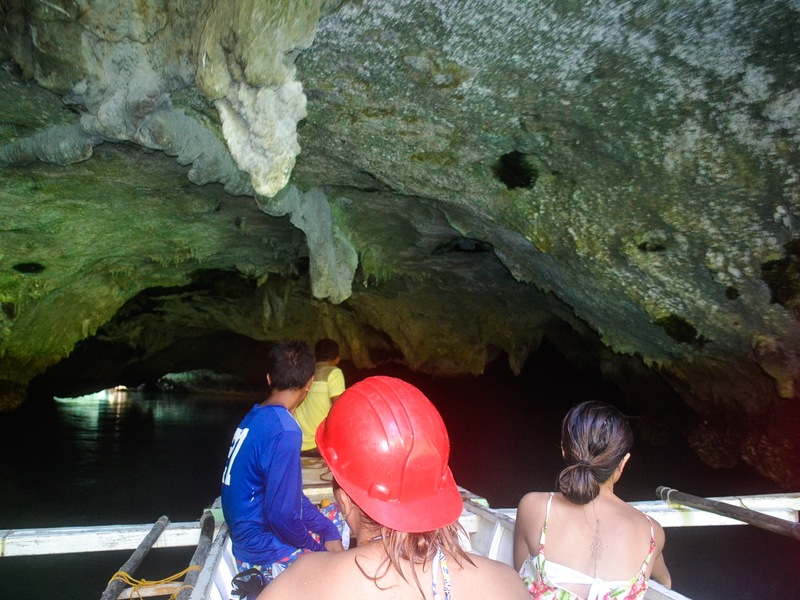 In order to get into the cove, we had to pass by the “underground river”. It’s around 50 meters long. We had to wear hard hats and dock ourselves since the water level is too close to the ceiling. As we went along with our tour, we passed by the horse’s foot rock formation which is made of stalactites and it barely touches the water. 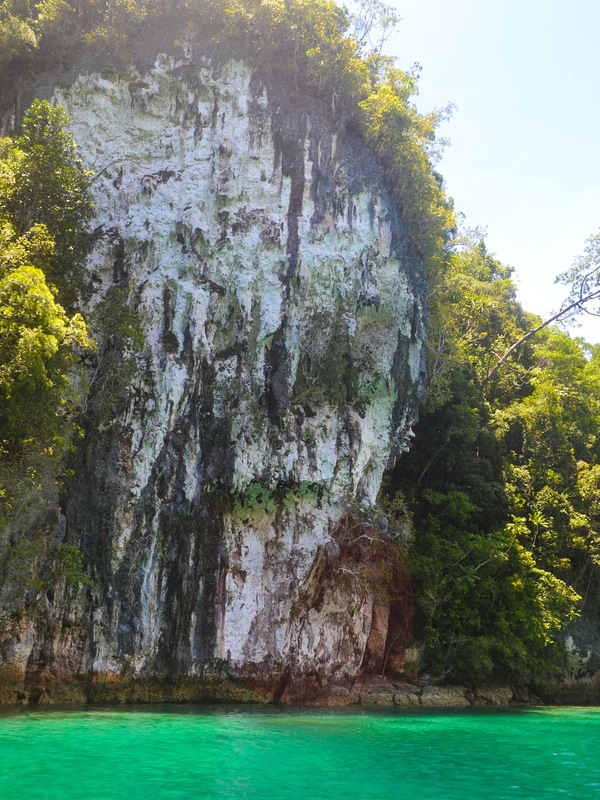 This serves as a landmark into the Sohoton Cove. Making a turn right before our first stop, our tour guide pointed to us the rock facade which is believed to be unearthly. It’s popular known as the Church Not Like Ours. The guide added that during Holy Week, mass songs and praises are heard by passersby. Our tour guide made the tour interesting with his stories. It made me so eager to learn more about the place and he was so accommodating with my questions. We arrived at Hagukan Cave. Its name came from the work “haguk” which means to snore. When the surface of the water touches the crown of the cave, it makes a snoring sound. We secured our life jackets so that it would be easier for us to swim and float through the cave. We had to submerge ourselves underwater to get inside. The entrance is about 3 meters long and if you’re not comfortable with plunging yourself then you can just float and lie your life jacket but you had to make sure not to bump your head since the height of the entrance is only about ten inches. Immersing ourselves in Hagukan Cave was a once in a lifetime experience. The beauty of the luminance of the waters with its glowing green light stretched out in the entire zone. It was indeed a mystical feel as you view your skin sparkle and everything seemed out of the ordinary. We found ourselves going further and the place became darker and the only light that illuminated our sights were the green waters. The tour guide positioned us on the near end and placed our feet on the stones. He then told us to look up and we saw a stone formation reflecting like a snake. We went back to our boat and proceeded to the next cave. The last stop on our Bucas Grande Tour was the Magkukuob Cave. As the cliche goes, “save the best for last” as this experience was undeniably the finale of everything. Before going inside the cave, we already had to make up our mind about doing the cliff jump towards the exit because it was the only way out. 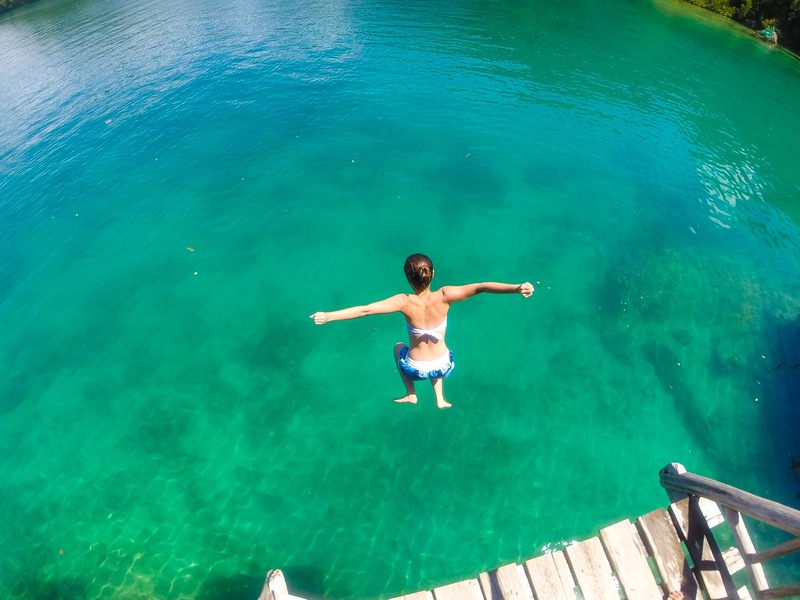 This is not for the faint hearted and if you’re the type of person who would take risks and be brave then this is one of the exciting places for you in Siargao. The entrance to the cave is relatively similar to that of the Hagukan Cave; however, the opening is a bit wider and taller. The water level in the cave is just above my waist and I’m about 5’1” ft. You can also observe the limestone and rocky formations as it is brighter inside the cave. Moreover, a unique stalactite can be discovered there which is similar to “horse’s foot”. As we went further, the water became shallow and the path was narrower. We made our turn towards the exit and we had to take a hike towards the top. To be honest, it was difficult because it was so dark and our flashlights were only dimly lit and we couldn’t see the way clearly. All we had to do was feel the stones and prevent ourselves from bumping into them. It was so steep and all the holds were pointy so we had to be cautious to prevent from hitting them. I even wounded myself with the hike but thankfully it was just a minor abrasion. Also, the track was confining that only one person at a time could climb the cave. We then reached towards the exit and it was a diving area. It was a wooden ledge and was suspended about fifteen feet. We had no other choice but to do the cliff jump. Going through it was a rush for me. It was time to bid goodbye to the ever beautiful islands of Bucas Grande. We returned to the their receiving area and transferred to our boat. We were managing our time to make it to the other three islands so we opted to have lunch on our boat on our way back to the main island of Siargao. Canvass prices of the tour to make sure you get a good one. Hotels offer higher prices so opt for dealing with locals. They know a good price. If you’re planning to spend the whole day for the Bucas Grande Tour, you can also visit the waterfalls and the Bolitas Cave. Coordinate with your boatman regarding your schedule so that they can manage your itinerary. Leave as early as 6 am from Siargao to get the most out of the place. Don’t forget to bring your sunblock. Apply everytime you get the chance. Bring an underwater camera. It’s a must. Be ready for any adventure and conquer your fears because this tour will just surprise you. On your way back to Siargao Island, you can pass by Naked, Dako and Guyam Island. If your starting point is from Surigao, make sure to make it to the port by ten in the morning. Can you post the name, contact number of your boatman to bucas grande. We will be going there this march. Thank you. This is a nice review. Very detailed! I will visit Butuan-Surigao-Siargao too in December. This got me so excited! Hi this is a nice blog, i wanted o go there next february and wanted to check in to the club tara resort but i also want to see siargao islands where i can go to dako beach . Is it possible that I can get island hopping tour for siargao islands coming from club tara and they can take us back after the tour? hello indira! nice meeting you in instagram. i’m not really sure with the club tara resort if they provide island hopping tours but you can contact them directly or you can have the option to try our boatman Francis 0948 752 2877 and tell him to just pick you up from the resort and proceed with the island hopping and return you home. please note that it can take up to 1 hour travel time from the resort to the mainland of Siargao Island for Club Tara Resort is just near Bucas Grande Islands which is up to two hours travel by boat. Thanks for the info. I will contact your boatman. 😉 If it’s too much travel, I will probably just stay in Siargao Islands just like you did so I can go to both destinations. hello! october is actually a good time to visit Siargao as the weather there is opposite in our usual season. If it’s rainy season in the city then it’s summer in Siargao. We actually went there in the last week of August last year. Don’t worry, i think it’s still safe to go there in that month and good luck and enjoy on your travel. You won’t definitely not regret going there. Hi, great sight and review! 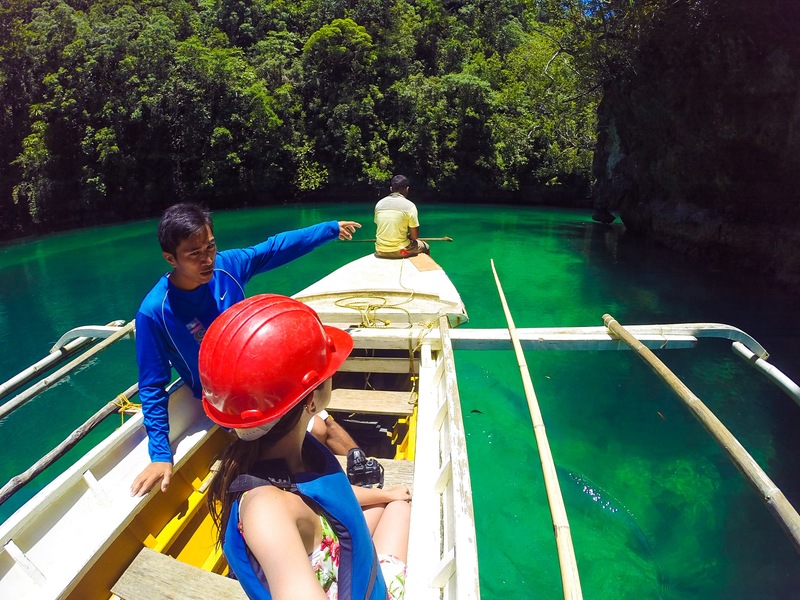 Hi Weng, we are planning to visit Siargao in January and I was wondering if you have the contact details of the boatman that you hired for the Bucas Grande Trip? The hotel that we will be staying offered 1600 for the Sohoton Cove, I’m not sure though if the trip includes the Bucas Grande. I’m hoping that it would. Hehe. hi! 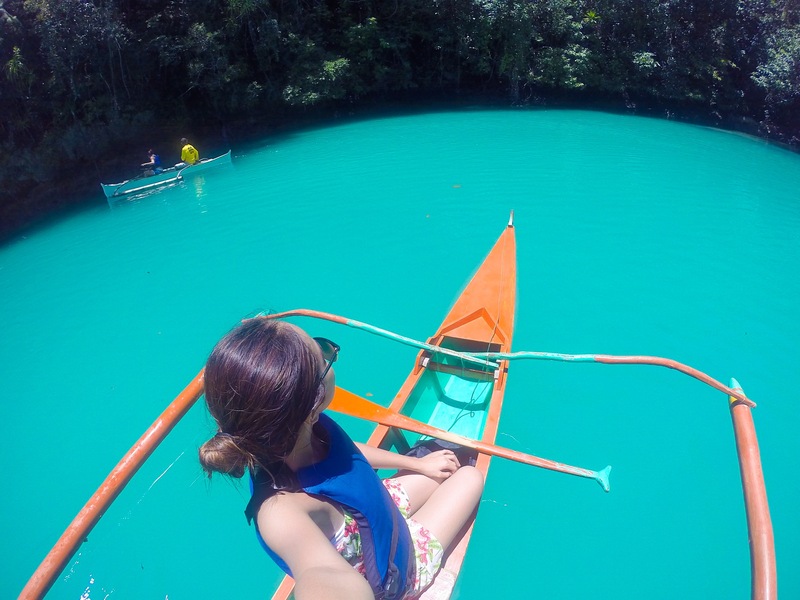 that’s a really cheap boat fare if you’re coming from Siargao! 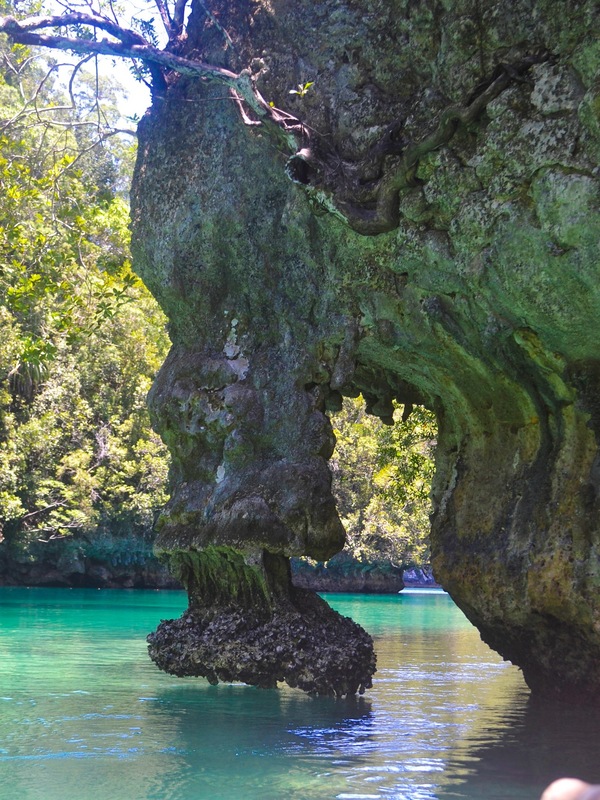 Sohoton Cove is located at Bucas Grande. Just negotiate with the boatman to visit other places as they are very near each other. That’s a good deal! do you still have contact number of your boatman? Hello Ms. Weng to confirm po half day kayo sa bucas grande then halfday sa tri island? kasama nadin po dun sa 4k tama ba?